Years ago, Corporal R. P. Beaudry was charged with sexual assault causing bodily harm, an offence under s 272 of the Criminal Code carrying a maximum penalty of 14 years’ imprisonment. Beaudry, a member of the Canadian Armed Forces, requested a jury trial. And because he was a member of the Forces, his request was denied. The Beaudry decision effectively froze the Forces’ ability to prosecute serious criminal offences within the bounds of their own justice system and threw dozens of ongoing military prosecutions into a state of uncertainty. On March 26, 2019, the Supreme Court of Canada (SCC) is scheduled to hear a Crown appeal from CMAC’s decision. The SCC’s decision on the constitutionality of military prosecutions for serious crimes will have significant ramifications for how military officials are prosecuted going forward. Beaudry, and all other members of the Forces accused of criminal offences, are subject to s 130 of the National Defence Act (“NDA”), which is contained within the statute’s Code of Service Discipline. Section 130(1)(a) classifies nearly all offences under the Criminal Code and any other Act of Parliament as “service offences,” bringing them within the jurisdiction of military courts. 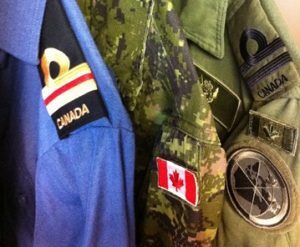 Before the CMAC ruling in Beaudry, the NDA authorized courts-martial to try all service offences committed by members of the Forces (except murder, manslaughter, and offences related to child abduction). Accordingly, s 130 of the NDA ropes nearly all criminal offences committed by military officials into a system of justice completely separate from civilian courts. The immediate effect of the CMAC ruling was to disrupt three ongoing sexual assault prosecutions within the military justice system. Officials warned that its further effect would be to toss 40 serious criminal cases — including 22 alleged sexual assaults — to already over–burdened civilian courts, eliminating the Canadian Forces’ ability to ensure that those offences were prosecuted. But in January 2019, the SCC denied an application to stay CMAC’s declaration of invalidity, leaving the Forces unable to prosecute offences attracting the right to trial by jury until the SCC’s final ruling on the matter in March. The SCC’s decision in Beaudry will chart a course for the future of military prosecutions of serious crimes. The Court will need to consider the scope of the exception to trial by jury for offences “under military law” in s 11(f), as well as whether any infringements can be justified in light of the military justice system’s long-term goals. The Court will also likely engage with concerns about “horizontal stare decisis,” which informs when appellate courts may depart from their own decisions. Prior to its ruling in Beaudry, CMAC previously found no infringement of s 11(f) on the same provisions of the NDA in R v Royes, and subsequently in R v Déry. Yet apprehension from the court Déry, albeit in obiter, led CMAC in Beaudry to conclude that the law on this issue remained uncertain. Advocates for the Rule of Law, interveners on the SCC appeal, argue that adherence to precedent is a key part of the rule of law, a fundamental constitutional principle. The SCC has previously dismissed a challenge to s 130(1)(a) of the NDA under s 7 of the Charter, but has not yet ruled on the provision’s constitutionality in the context of the right to a jury. By virtue of its controversial nature, the Beaudry case has made national headlines and thereby increased public exposure to the military justice system. The SCC’s incoming decision on this matter may push us to consider the utility of having a separate system of prosecution for military officials at all. On one hand, members of the Canadian Forces risk their lives for members of the Canadian public, and their constant exposure to dangerous situations amplifies the need for group discipline and cohesion. One might consider internal prosecution of acts of disobedience, including of criminal acts, to be one manner of achieving that objective. At the same time, Beaudry illustrates the injustice underlying the separation of these two systems. If members of the Canadian Forces are not entitled to trial by jury for serious offences, the exception in s 11(f) creates a two-tiered system of justice. Barring access to jury trials seems arbitrary if the accused is not charged with an offence against military order — essentially, it denies the accused a right based on their occupation, regardless of whether their charges are related to their service. Finally, it is worth considering the particular impact the Beaudry decision may have on prosecutions of sexual offences, many of which carry serious penalties under the Criminal Code. The Canadian Forces have previously come under fire for failing to properly respond to sexual assault and harassment. The NDA has enabled the Forces to prosecute sexual offences by court-martial for over 20 years. An inability to prosecute these crimes in military court because of s 11(f), if that is what the SCC decides, will hopefully put pressure on the military to respond using other disciplinary mechanisms and implement proactive measures that will spur change on an institutional level.